Like all fine vehicles and machinery, motorcycles need periodic maintenance and servicing to ensure long life, optimum performance, and reliability. 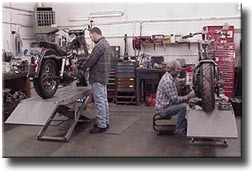 At Big Pete's Cycle, we believe in the old adage that says "Keep your motorcycle well, and it will keep you well!" Our Harley factory-trained and PHD Certified technicians know what is needed for both older and newer bikes. And we believe in assisting our customers to be well-informed owners and riders.